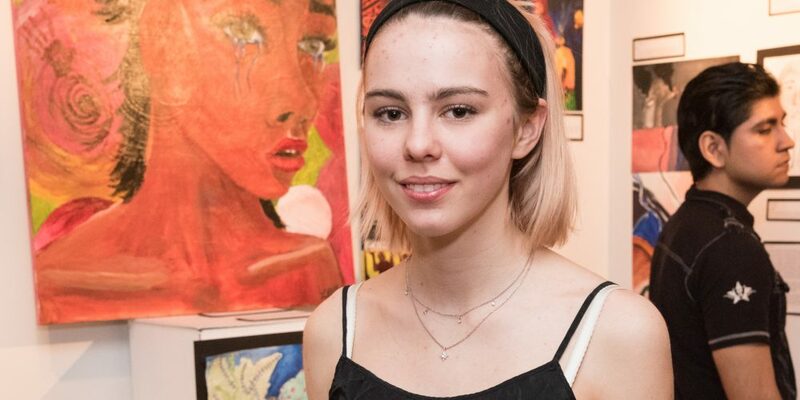 In early March, IB Visual Arts students in 11th and 12th grade showcased their work at a professional art gallery in Brooklyn. We caught up with BPHS Senior, Savannah, about her artistic journey through the International Baccalaureate program. What does the art you’ve created in the IB Visual Arts class mean to you? The art I create is very personal to me. Before IB Visual Arts, it wasn’t purely aesthetic but my emotional connection was not reflected in the depth of the work, and I didn’t have pre-planned and thoroughly thought out themes or symbolism. The art I have created in IB Visual Arts has harnessed all of the emotional connections I have to my art through the extensive research and brainstorming process. My art now has become a way to reflect on ideas that before were not fully formed or clear to me. Some might see IB’s pre-art process as excessive or restricting but I feel like it really helped me in developing my style thematically, and thus visually. How has your IB Visual Arts class opened your eyes to new perspectives, cultures, or ways of thinking? IB visual arts class has opened my eyes to new perspectives and cultures through the art-making process. Being pushed to use new materials and styles of art, I began to explore new materials that I wouldn’t think of if I had been taking inspiration from strictly European style art or what I would instinctively think of as visual art. I also was able to see how different cultures make art differently, for example, in a lot of Asian art they use empty space rather than stuffing the work full of patterns. Do you see yourself continuing to make art after you graduate? If so, what do you hope to do? I am definitely going to continue my art after graduation. IB art has cemented artmaking into my lifestyle and taught me to be bolder in my style and process. I hope to expand my art into the fashion world and combine my paintings with clothing and accessories to make it more marketable to my generation. I also hope to have a lot of time and space to work on art during my gap year which would let me do bigger, more ambitious pieces. Are you heading to college? I am planning on going to college, I applied this year and am waiting for results. Before I go I plan on taking a gap year and moving to France to work on my art and get a job to save for college. IB has prepared me for college because it taught me how to write essays effectively and made me very organized in my schoolwork. If IB teaches you anything it is how to manage a seemingly impossible workload. What I’ve heard from my friends who are already in college is that the workload only gets worse, so being prepared is a vital asset. IB also teaches students to explore multiple perspectives which adds a certain level of professionalism and authority to your ideas. 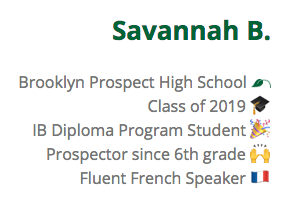 Favorite thing about Brooklyn Prospect? We are given a lot of opportunities that high schools don’t often give. Being able to present my work in a gallery as a final assignment is a great example of this and it really was a show of our own design. We were given free rein over curation and even before that, our prompts for creating art were up to interpretation. I think Brooklyn Prospect does a good job of that, allowing students to use the curriculums to fit their own interests.